U.S.-based magazine Wine Enthusiast teamed up with China online retailer YesMyWine last year to publish an e-version of the magazine. In August, a Wine Enthusiast team that included CEO Sybil Strum, executive editor Susan Kostrzewa and communications director Jacqueline Strum came to China for a three-city visit that covered classes, dinners, and tastings featuring 15 producers from around the globe. I asked Kostrzewa a few questions about the trip. This was your first visit to China since Wine Enthusiast started its Chinese edition. What were the main goals of the trip? 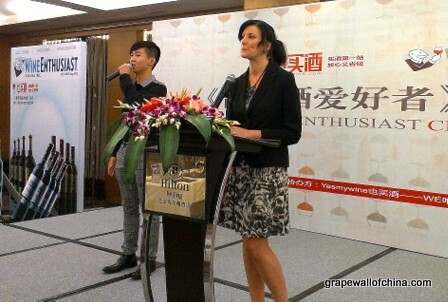 To promote our Chinese editions and to learn more about the wine market and wine culture in mainland China, primarily. What was the biggest surprise, in terms of the wine scene? How adventurous and knowledgeable the consumers were. They were more open to new varieties and styles than most American consumers are, to be honest. And they were serious in their pursuit of education. It was surprising to me how many consumers were pursuing their WSET certification just for fun. What were the biggest differences among wine consumers in the cities you visited? I’d say they were all pretty invested in learning more. Some cities are just further along in the exposure they are offering to wine and wine culture. Obviously Hong Kong is the most advanced. Then Shanghai after that. But again, the wine consumers we met in all of the cities were quite sophisticated. How does the Chinese edition of Wine Enthusiast differ from the English edition? 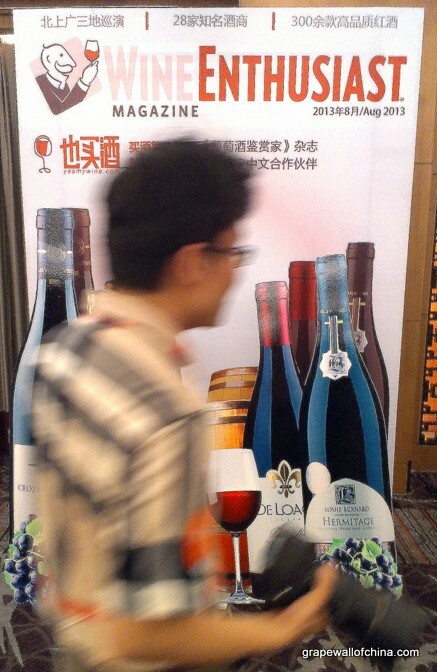 We focus on wine topics that are geared toward the Chinese consumer. We cover the styles of wines they like, mixing high-end categories like Brunello with up-and-coming wines from regions like Rioja. Plus, we’re focusing more on wine education in our Chinese pages. There’s more of that edit than in our American version, as the typical American reader is a little further along as regards regionality, terroir, etc. Also, we’re writing about local topics, such as the best wine bars in Shanghai and winemakers of note working on Chinese domestic wine projects. Did you learn anything on the trip that will change how you cover this market? Yes, many things. Again, I recognize that Chinese consumers are adventurous in taste, which makes sense given the vast diversity of culinary traditions and flavors in China. I also know that the pursuit of knowledge is not flippant in China. We have to keep pace because the wine consumer in China will demand it. They are discerning. Wine Enthusiast is currently an e-publication. What would it take to get it to print? We made a conscious decision to make this an e-publication, based on advice from people living and doing business in China. But if people decide they’d like to see a hard copy version of the magazine, they need to let us know! China Wine List of the Year 2013: Who’s got a 350-page menu and 10,000 bottles?